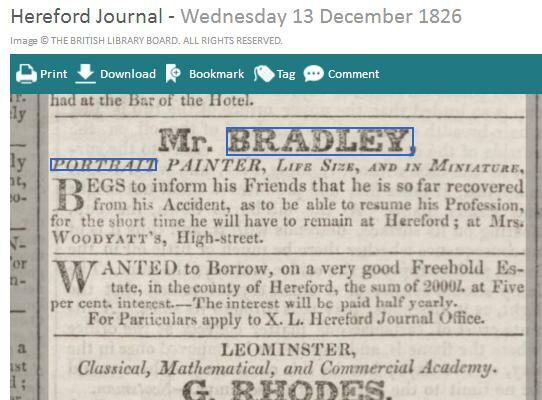 Portraits: British 19th C 39 comments Did John Bradley (1786–1843) paint a member of the Loder family? This is just speculation but might be of interest. William Loder was Edward Loder's younger brother. He played the cello. William Loder was married to Emily Loder (née Woodyatt), an opera singer at Covent Garden. Emily's sister, Marianne Bradley (née Woodyatt) was married to John Bradley (1786) who, in 1814 was a student at the Royal Academy and a friend of Charles Stothard FSA. I understand John Bradley painted a portrait of Queen Victoria as a child when she was at Great Malvern. Because of the connection, this painting could have been painted by John Bradley (1786–1843) – maybe further investigation by experts will come up with something more concrete? None of the few portraits under the name of John Bradley on artuk.org do not seem in the style of this portrait. Were there two artists called John Bradley? The Staton Island John Bradley portraits are indeed very different to the British John Bradley who painted a portrait of the young Queen Victoria. I have seen a self portrait of John Bradley on the internet and it does seem to be in the same style as this portrait of Loder - although I have no knowledge of art at all! I've got involved in this discussion simply because I am a descendant of Emily Loder's family and researching family history. I haven't seen the portrait of the young Victoria but would love to. I'd also be interested to know what you think about the self portrait of John Bradley and this one of Loder. Who knows, I might learn a thing or two about art. 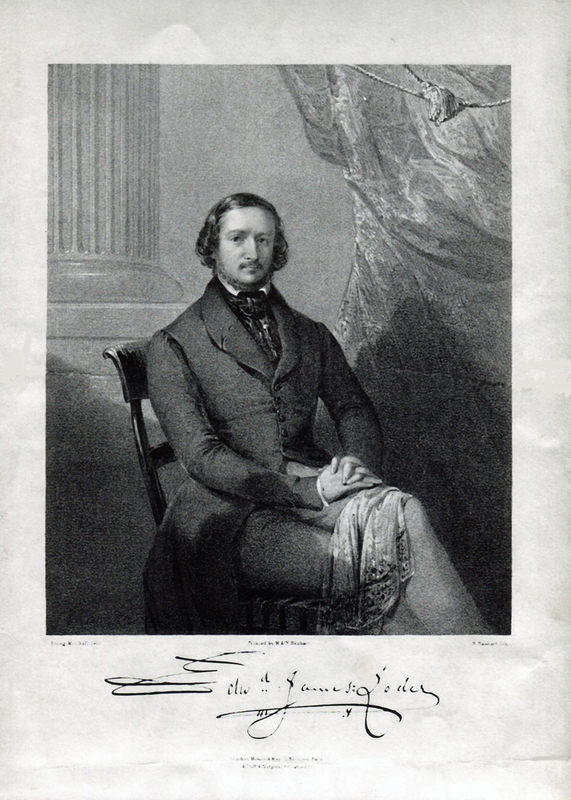 Bradley certainly seems to have painted Emily Loder, as he exhibited a painting called "Mrs. Loder, late Miss Woodgate" [sic] at the Royal Academy in 1843. This was, however, a miniature. The address given for Bradley in the 1843 catalogue - 47 Pall Mall - is that Bradley & Co, a noted firm of china decorators. It's easier to imagine a china decorator doubling as a miniaturist than painting many of the curious mix of oil paintings attributed to him on artuk. The self portrait in Keighley Museum seems to have been by someone completely different to the miniaturist who painted Mrs Loder: that John Bradley lived in Keighley almost all his life and taught the Brontes. 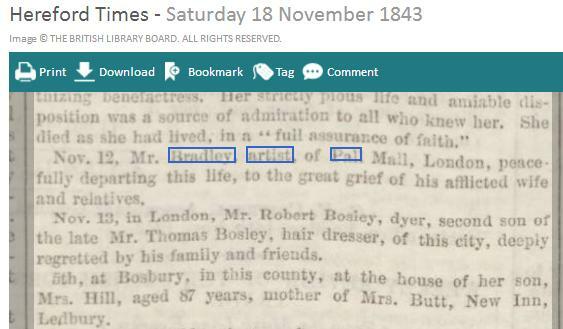 'The Oxford Companion To The Brontes' gives his dates as 1787—1844. It would be interesting to know their source for this. The ' Oxford Companion' also says that "Baines's Directory of 1823 lists him as a house and sign painter of Wellington Street, Keighley, but he preferred to call himself an artist. " You're right, Oliver, the two John Bradleys are quite unconnected, and neither has anything to do with the British-born American folk artist (who probably came from Suffolk). The Art UK entry supposedly for the man under discussion, John Bradley of Pall Mall (1786-1843), probably doesn't show even one work by him - most are by John Bradley of Keighley, plus one that is clearly a copy (though mis-dated earlier than it) of William Bradley's portrait of Sir Robert Seppings at the NMM - see http://static.artuk.org/w1200h1200/NMM/NMM_NMMG_BHC3019.jpg . There is no discernible connection between William and either John, and I doubt the Norfolk Museums' attribution of their copy. 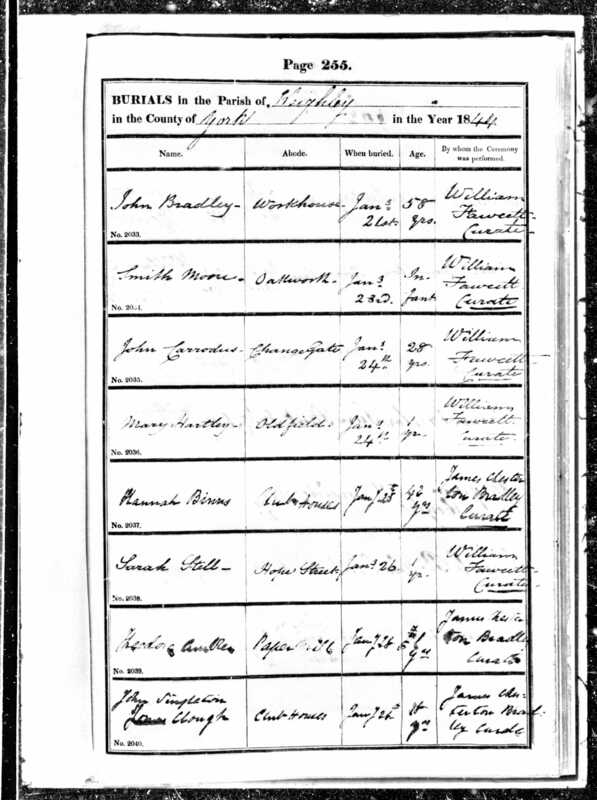 The Keighley man is said, in an authentic-seeming Ancestry.com pedigree full of precise detail, to have been born 17th July 1787 at Keighley (though I cannot find other evidence for this), and to have died at the same place (sadly in the workhouse) on 17th Jan 1844 - the latter is confirmed by contemporary death notices, including the attached one from the Manchester Courier, "in his 58th year" (should really be 57th if the birth date's right). 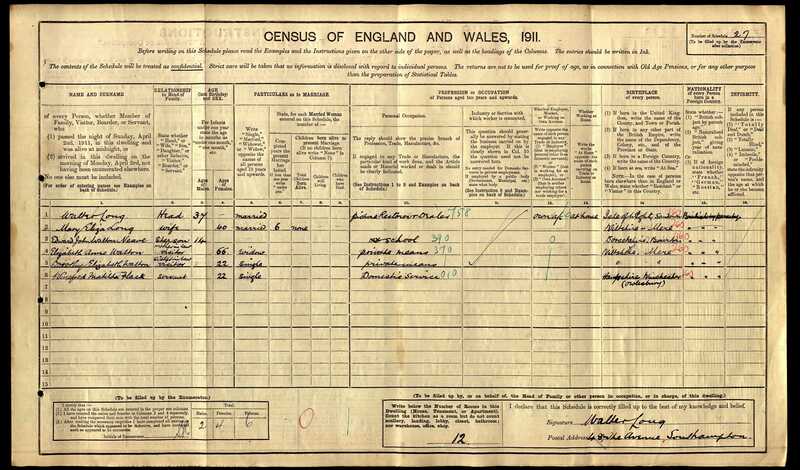 The (June) 1841 Census gives his age as 54, which within a month he would have been. There is quite a bit about him in 'The Art of the Brontes'(1995): most of the relevant bits are currently visible on the Google Books preview here https://books.google.co.uk/books?id=h4eZmrII2Y4C&dq; . And I've just found excellent evidence of his Bronte relationship in an 1861 letter to the Bradford Observer from someone who knew all the parties well - also attached. 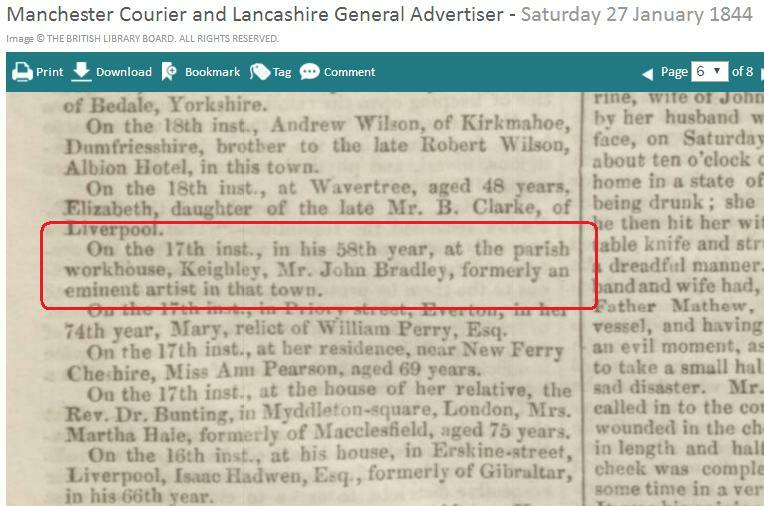 The Buildwas place of birth is indeed correct for our John Bradley - he was baptised there on 7th Jan 1787, and the obituary with his birth date is a good find. He came from a Quaker family, and had three younger brothers, two of whom (James Watson & Andrew) ran the glass and china business at 47 Pall Mall. The 1830 Princess Victoria miniature is in the Royal Collection (but unillustrated): http://www.royalcollection.org.uk/collection/913942/ . I cannot find any other actual oil paintings, and his portraits seem to have been mainly miniatures. The V&A has a number of theatrical prints after his work, drawn or painted for 'The Theatrical Inquisitor' - there are images, but they are very small. For example http://collections.vam.ac.uk/item/O1259186/mrs-dickons-as-rosina-print-bradley/ (a search will uncover the others). The theatrical connection is significant, especially as several are singers. The BM has a strange version of the same print, but also another one of the evangelical Hereford cleric Henry Gipps that does seem to be after a painting, and I would say is comparable: http://www.britishmuseum.org/research/collection_online/search.aspx?people=131300&peoA=131300-2-70 . It was published as well as painted by Bradley. I think the circumstantial case for Bradley being the artist of the Loder painting is looking pretty good. 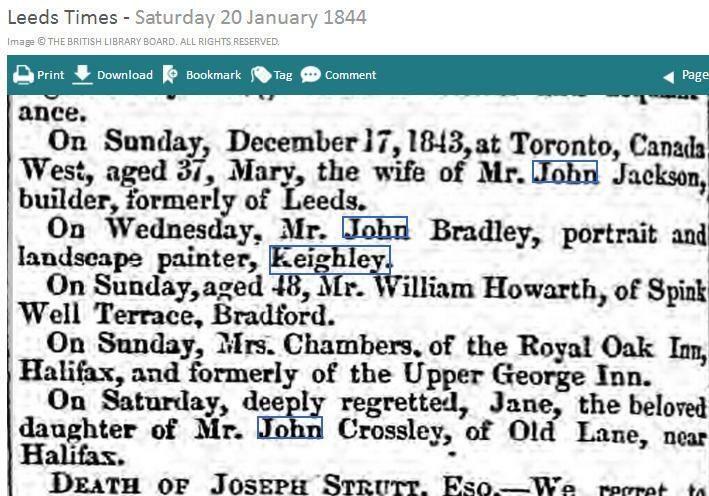 I've found the obituary of John Bradley of Keighley, in a Swedenborgian magazine, which says he died on 23 January 1844 "in his fifty-eighth year"
Good to have support for the age, but the date given must be wrong. His death ("on Wednesday") was first reported in the Leeds Times of Saturday 20th Jan, and he was buried on the 21st. There were death notices for John Bradley of Pall Mall in the Hereford Times on the 18th, and the Hereford Journal on the 22nd Nov 1843, both giving the 12th as the date of death. Bradley's portrait of Mrs Loder is actually correctly titled in the original 1843 RA catalogue, the error was Graves's:"Mrs W. Loder, late Miss Woodyatt" - but it was, indeed, a drawing or miniature, as were his two works exhib 1838 & 1840. 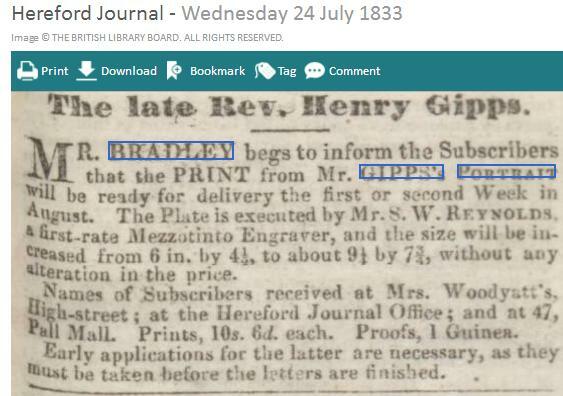 I also appear to be wrong about the 1833 print of Rev Henry Gipps being after an oil painting - a contemporary Hereford newspaper said it was to be "A lithographic drawing from an admirable miniature likeness..." (in the event it was a mezzotint). See attachments. So we really do need evidence that he painted larger scale oils as well as miniatures if this possible attribution is to have legs. 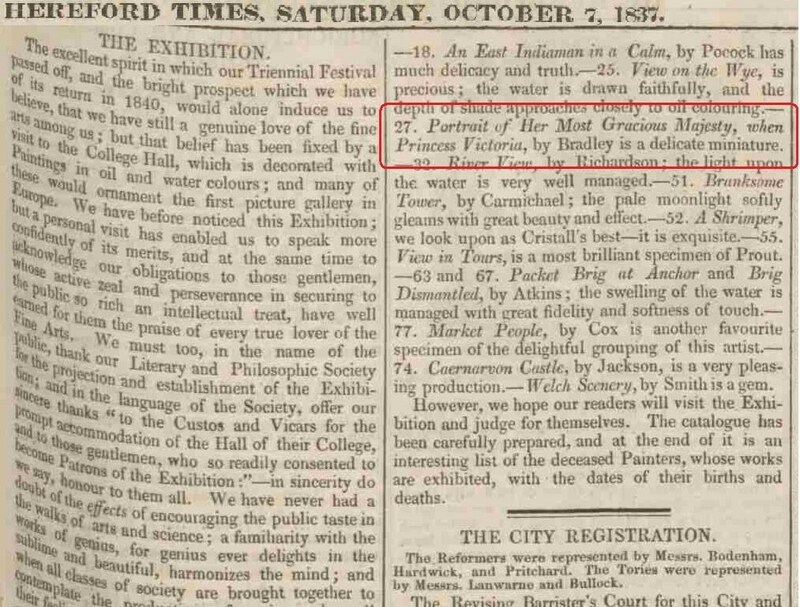 I don't have ready access to the catalogues for his earlier RA exhibits (1817-37), and the later arrangement, whereby numbers from the 500s or so upwards (and later on the 600s and then 700s) can be assumed *not* to be oils, seems to have been less clear-cut before the late 1830s. Nevertheless, two portraits exhibited in 1834 & 1835, and numbered 429 & 299, stand a good chance of being oils, especially the last - see Graves: https://archive.org/stream/royalacademyofar01grav#page/264/mode/2up . The SBA 'Works exhibited...' book is more informative: of the 19 works by Bradley 1828-43, all but five are marked as 'wc/min/print' (and later 'wc' or 'drawing'). Three of the five are portraits, shown in 1830, 1831 & 1842, and we can probably assume they were oils. See attachment. 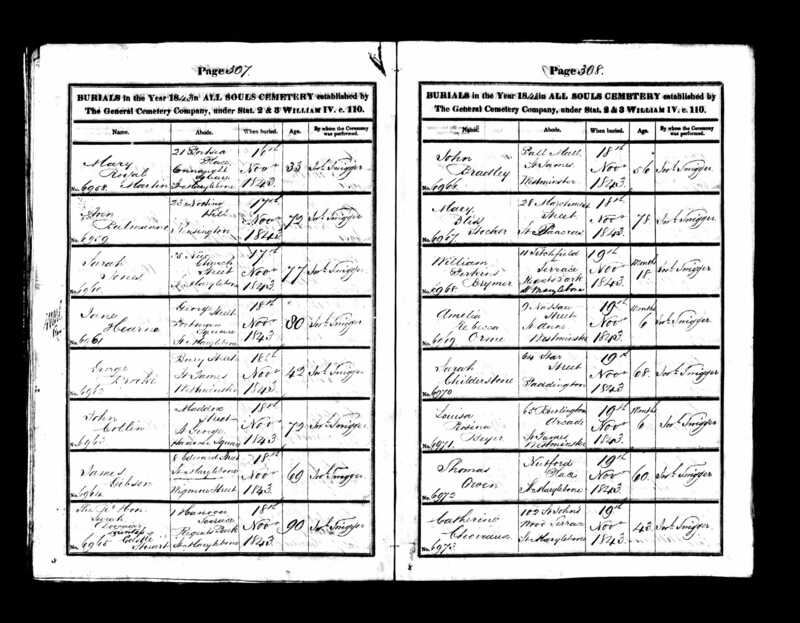 The 1831 work was 'Miss Woodyatt', John Bradley's elder sister-in-law, Emily (aged 17), who was to marry William Loder in Oct 1841. If this portrait *is* of William, it would certainly make sense for Bradley to have painted him c1841 as a pair to that of his wife. 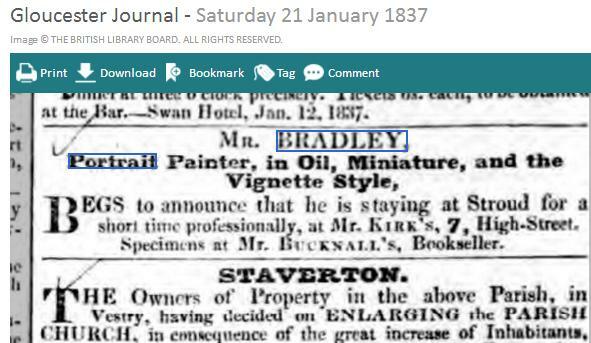 Alternatively, if the date is definitely 1839, Bradley could have been the person who introduced the couple. We still don’t have absolute proof that he painted larger oils, but it’s looking very likely. 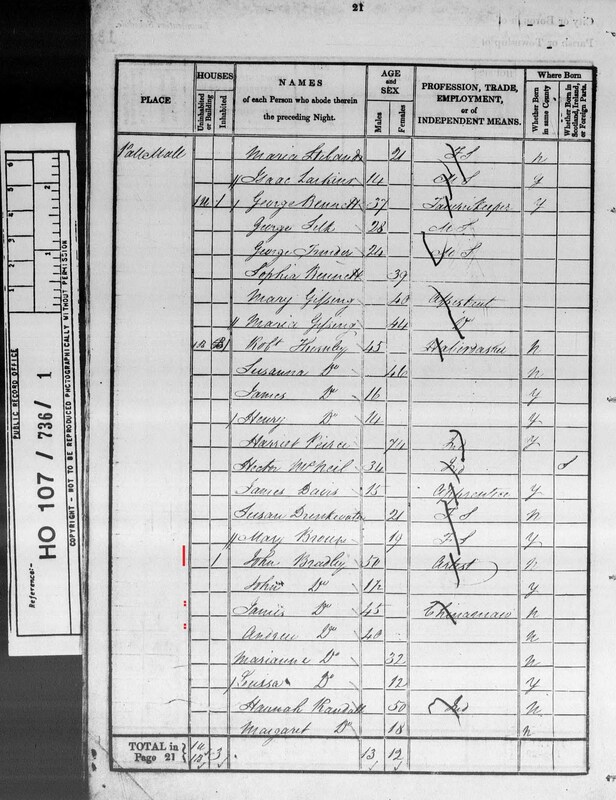 I’m also attaching the 1841 Census entry for John Bradley and family at Pall Mall, together with his two brothers. Sorry, going mad - William Loder is not one of the suggested sitters, so ignore much of the speculation above. John Bradley advertised his visits to the west of England quite extensively during the 1820s – first, to Worcester, in Dec 1820 (attached); then Hereford in Oct & Nov 1823 (one attached 5 posts above), Jan & Dec 1824, Nov 1825 and July 1826. 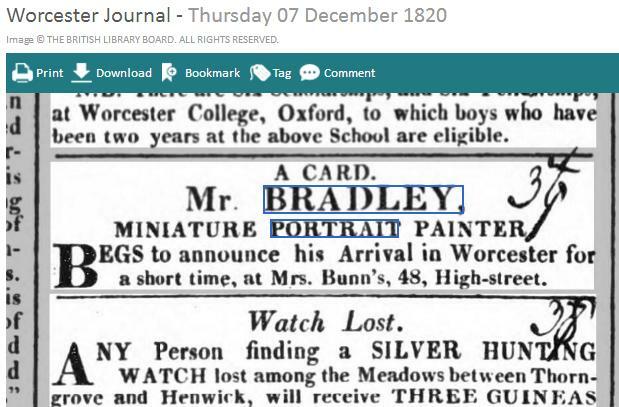 These all describe him only as ‘Miniature Portrait Painter’ – similarly, when his coach accident was reported in the local press in Oct 1826 he was referred to as just ‘Mr Bradley, miniature painter’. However, his next advert two months later, in which he says he has recovered enough to resume work, is headed ‘Portrait Painter, Life Size, and in Miniature’ (attached). 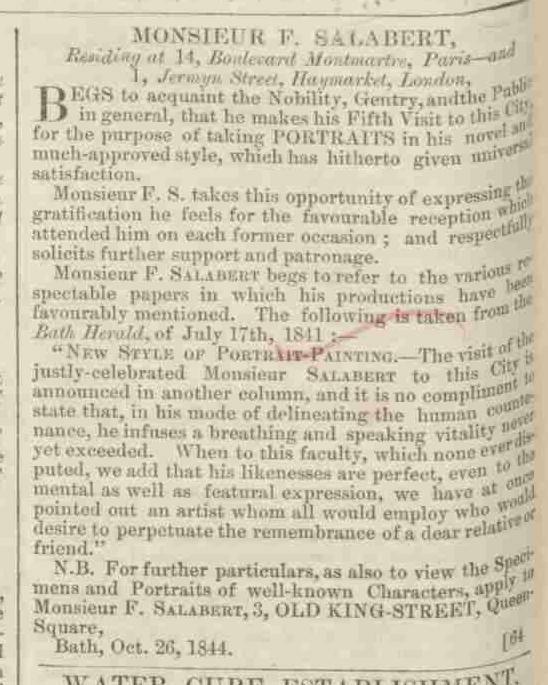 And a much later (1837) advert announcing a short visit to Stroud has a heading that reads ‘Portrait Painter, in Oil, Miniature, and the Vignette Style’ (also attached). So there there it is – we have our proof that John Bradley of Pall Mall painted large portraits in oils. Much good information has been brought forward by Oliver and Osmund on the identity of the artist John Bradley (1786-1843) who, it was already surmised by S.B. in the original question, might well have been the painter of the portrait of Loder. Bradley carried on a successful career in London and in various locations in the West Country, especially at Great Malvern. He also published prints from his address at 47 Pall Mall, where his brothers had a china manufacturing and/or decorating firm, with Queen Victoria as an eventual patron (hence perhaps Loder's commission to paint a miniature of Victoria). The Royal Collection has some of Bradley's views of the Malvern area. Osmund has shown that Bradley, although primarily a miniaturist, advertised his services as an oil painter as well. Some confusion arose due to another artist named John Bradley with similar dates (1787-1844), this one of Keighley in Yorkshire but he was an active Swedenborgian (as Oliver noted) with ties to the Bronte family. Indeed it seems to be his self-portrait on ArtUK which has the wrong dates and these will need to be changed. However, we also come back to the question of which member of the Loder family of musicians this portrait depicts. Bradley was connected by marriage to William Loder (1812-51) who married the artist's sister-in-law in 1841. In order to finalise the discussion, we probably need to confirm that the portrait shows William. Also, and importantly, what is the authority for the date of 1839? If it is inscribed on the painting, can we seen a larger image and/or detail? Barbara, I don’t think William Loder has been suggested as the sitter. Although it was his marriage that provided the link to John Bradley (via their wives, who were sisters), he was very specifically a cellist, not a violinist. I may be the cause of the confusion, sorry, as I made the same mistake in my last big post but one (but corrected it subsequently). See attachment 1. Yes, we should probably have addressed the matter of the sitter’s identity before concentrating on the artist. The collection’s response in the intro above – and the RAM catalogue entry http://www.ram.ac.uk/museum/item/24764 – correctly doubt the traditional identification as Edward James Loder (now known to have been born 1809, not 1813). There are two known prints of Edward Loder, one of them from about the same period (see attachments 2 & 3), and his appearance, especially the moustache and beard (later chin tuft) in both, make it pretty clear he’s not the sitter in our portrait. Moreover, there is no evidence that Edward was really associated with the violin, though he certainly wrote string pieces and orchestrations – but he was essentially a composer, arranger and conductor, and his instrument was the piano (for which he wrote a Tutor, published in 1839). The 1729 “Innes/Loder” Stradivari violin mentioned in the RAM piece would seem to be wrongly linked with him. 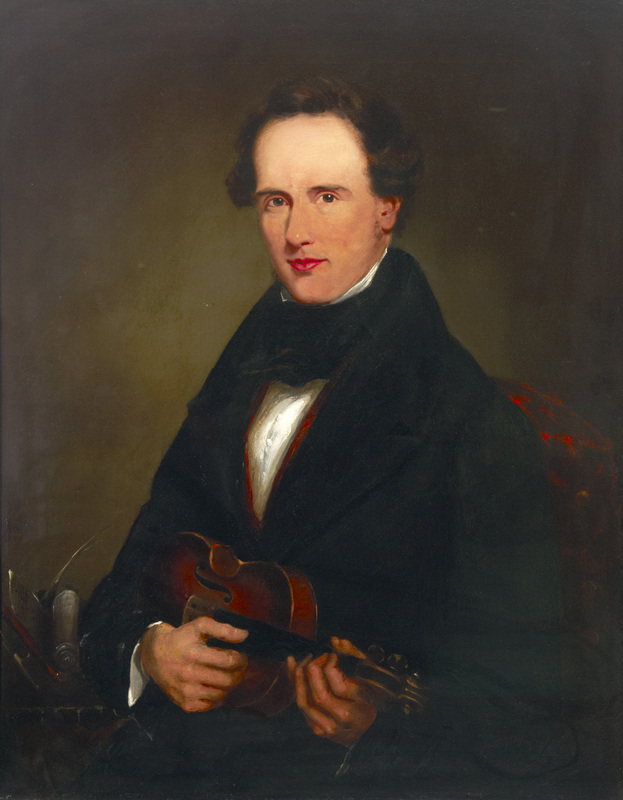 Early information is scarce, but as far as I can see the previous owner is said only to have been ‘Mr Loder’ – and this seems much more likely to have been Edward’s father, John David Loder, one of the leading violinists and orchestral leaders of his day. Indeed all the recent sources I can find state this as fact. See http://tarisio.com/cozio-archive/property/?ID=41552 . 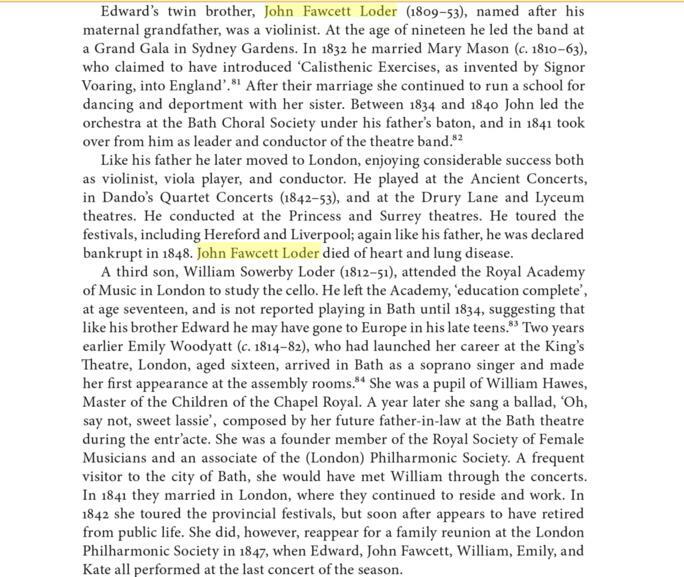 I suppose it might have been inherited by Edward, or indeed one of his brothers – perhaps his violinist twin brother John Fawcett Loder. The difficult question to address is how certain are we that the portrait is in fact of *any* member of the Loder family? And the answer, in truth, is not very certain at all. The portrait was presented to the RAM in 1927 by Arthur F Hill, of the renowned London firm of WE Hill & sons (Arthur was one). The Hills were violin makers, repairers and dealers, and Arthur was the co-author (with his brothers) of the standard work on the life and work of Stradivari, on whose instruments the Hills were the world’s pre-eminent experts. Hill had apparently bought the painting in 1915 from a Mr Walter Long of Southampton, who was said to have acquired it from an antiques dealer who found it in Somerset. The RAM say they have been unable to establish the date or writer of the rear label that apparently bears the dating (?and identitying) inscription. Walter Long turns out to have been a picture restorer and dealer (see attachment 5). He may well have had a particular interest in things musical – both his father and elder brother were or had been music teachers. It is hard to escape the suspicion that he may have tapped the family’s musical knowledge to find an interesting (though in fact misconceived) new identity for the portrait that would make it more attractive to the man he was going to offer it to – I have found no sign that Long had a shop that Hill could have just happened upon. If so, he was neither the first nor the last dealer to do so – in the early C20th, with historical information less freely available than now, unknown portraits were routinely given often quite ridiculous new names. Indeed a Beechey of a forbear of mine, Juliana Watson, crossed the Atlantic in about 1920 with the much more appealing new moniker of “Lady Pamela Gordon”, despite such a woman never having existed, and the name ‘Pamela’ being virtually unknown amongst aristocracy when the portrait was painted in 1804 (though popular by the 1920s). We shall probably never know if that’s what happened, but I agree with Barbara that we at least ought to get have a look at this label/inscription – in fact I would say it is absolutely essential before expressing an opinion. Thank you, Osmund, for this further information on the Loders. Of course, the portrait may not show William but he is the individual with the closest connection to Bradley of Pall Mall, so should be ruled out (mightn't a cellist chose to be painted with a violin, perhaps his second instrument?). And, yes, identifications of portraits in the past may have been optimistic on the part of owners and dealers. 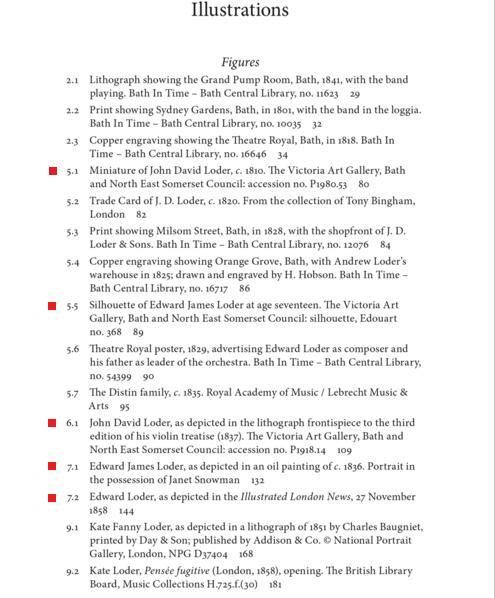 The RAM's post refers to the recently published book on the Loders in Bath edited by Nicholas Temperley. If the collection could lend a hand in this matter, it would be helpful to have his opinion or any of the authors who contributed to this book. I cannot tell from the only partial viewing of this book online whether this portrait was used as an illustration, but it does not appear so. And, ArtUK, we will need to see a larger image and detail of any additional information on the surface or verso of the picture--labels, inscriptions, especially the date, etc. if we are to make any more progress on this question. One other point. 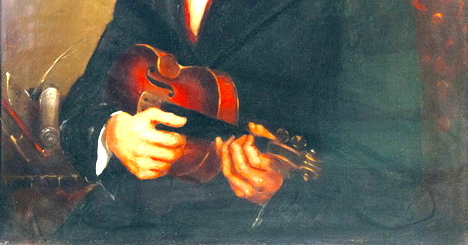 The portrait shows the sitter not just casually holding his violin, but playing it in “guitar position” – either picking out a pizzicato with his thumb, or possibly strumming a chord “quasi guitare”. This is a most unusual way to depict a serious musician. As I understand it, the position is very seldom taken by orchestral violinists, and then only when there is an extended passage or complete piece in pizzicato – to show him like this with no sign of his bow at all seems to be making a point. I wonder if either (a) it refers to a specific piece written thus; or (b) the violinist was well-known for playing in the style – a sort of ‘party trick’ like Jimi Hendrix playing the guitar with his teeth; or (c) the intention is to present him as more of an amateur or ‘folk fiddler’ than an orchestral violinist. But this is not my area at all, and input from a knowledgeable musicologist would be very welcome. It would be good, too, to see a close-up of the bottom left corner, where the RAM notes “a quill and a roll of manuscript paper, iconography usually associated with a composer”. I can’t make sense of the object, which seems to have more to it than just a “roll of manuscript paper” – is it some sort of stand? 'A Stradivarious known as 'The Loder' sold at Christies for 14,500 guineas. It belonged to Loder who worked as Professor of Music at the Royal Academy of Music'. Again, just me speculating, but could the above Stradivarious be the violin being held by the sitter? My personal opinion is the sitter is John Fawcett Loder, who performed with his brother William and Emily (nee Woodyatt). Emily, was, as you know, John Bradley's sister in law. Yes, the 1729 'Innes/Loder' Stradivari was sold by Christie's in 1935 & again in 1969, and by Sotheby's in 1988. It most probably belonged to J F Loder's father, John David Loder (d. 1846), who taught at the RAM. Loder senior left all his property, including unspecified "musical instruments", to his widow Rosamond - but it is not known whether the Strad was among them, and if so, where it subsequently went. One or other of the auction catalogues may possibly elucidate. The strad ended up with Hart & Son in 1918, but it is impossible to say whether it is the instrument in this portrait, as there is nothing to distinguish it from the millions of Strad 'copies' coming out of Germany during the 19th century. It may have been re-finished a number of times so the colour and patina would be quite different. Additionally, the artist hasn't done a very good job painting it. Re: the informal position, since he is in front of a lectern with a rolled up piece of music and a quill pen, it would suggest he was mid composition, and if he's working on melody the bow would be surplus to requirements, especially if scoring and dipping the pen between ideas. I see it as more of an 'at work' pose rather than an informal one. We need to track down an image of John Fawcett Loder - according to Temperley's book, a number of portrait miniatures relating to the family were donated the Victoria Art Gallery in Bath. Has anyone contacted Nicholas Temperley yet? He must know this portrait and every other Loder family portrait pretty well. I've tried a bit of digital enhancement on the bottom left corner of the painting. The result seems to show a jumble of books with a peculiar cylindrical object, a little too solid to be a rolled manuscript, perched unsteadily on top. The whole arrangement fits in very awkwardly with the man's elbow. The collection have given permission for this image to be posted on the discussion. The cylindrical item looks like roller, with wooden turned ends ( not unlike a later pianola roll), for a continuous scroll of paper, though it appears to have writing on it rather than musical notation. There is a quill pen beyond which also suggests the arrangement is as much for writing on the scroll, and the stand it is on, as much as reading off them. There must be aficionados of 19th-century musical apparatus so, should any of them see this discussion, please make a suggestion! Sorry Peter, I have to disagree - I can see two large (oversized) staves, the upper stave with a cleff and three notes, and the lower stave mostly obscured by the shadow, but some notes are visable - on a sheet that terminates in a roll with another stave visable in the highlight (far end) on the roll. Its just not very well executed. OK: your eyes sharper than mine, and it makes more sense, but the 'device' -whatever it is- is still intriguing: I thought musicians normally wrote on sheets or folios of paper rather than rolls as apparently shown. '... The catalogue entry refers to an inscription on the back of the canvas dating the painting, 1839. However, there is no reference to any further markings or an image. Also, the person who made this inscription has not been identified. A letter from John McEwen, Principal of the Royal Academy of Music, to Arthur F. Hill, the donor of the paintings, dated May 4th 1927, refers to the portrait in the first line: 'Many thanks for so kindly sending the portrait of E. J. Loder. I have had it hung in the Lecture Hall, and as I understand from Dr Richards that you are going to give us the pleasure of your company at lunch tomorrow, you will be able to see how it looks there'. A note relating to Arthur Hill records that he purchased his portrait of E.J.Loder (who owned quite a good Stradivari) in February 1915 from a Mr Walter Long of Southampton, and 'according to the inscription on the back of the canvas it was painted in 1839'. Previously it had apparently been acquired near Wincanton by an antiques dealer, and it was unframed. Neither the date of labelling and the person who labelled the painting on the rear of the canvas cannot be established. 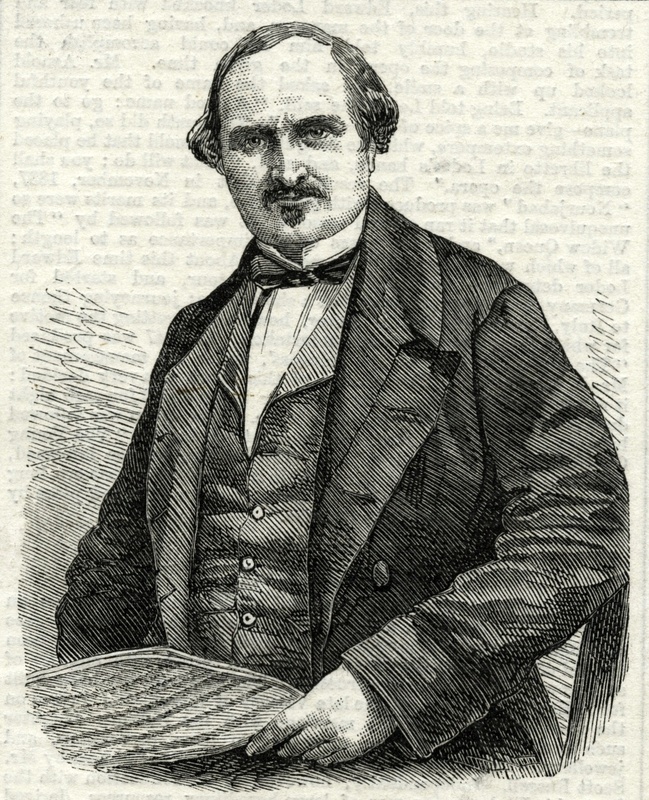 A lithograph by Mitchell, published by Hanhart (undated but c.1835) and with the composer's facsimile autograph, shows the youthful Edward Loder at this time to have a moustache, and this personal feature is also shown in a later engraving from 1855 published in 'The Illustrated London News'. Tim, yes - it could show someone composing, as the scroll does indeed show music, however roughly. But he could equally be just reading it - when you depict someone writing something, it is more usual to show them doing just that...and as Oliver observed, the positioning of the 'device' is incredibly awkward: who would write on paper at such an elevated angle (though perhaps it's just poor painting)? Moreover a viola player I met last weekend disagrees that the bow would be 'surplus to requirements' when composing - she thought that it would be very limiting, since bowed notes and chords would normally comprise the vast majority of sounds in the music being composed. Which leaves us back to the idea that there may be significance in the style of playing shown, whether he is composing or not. But perhaps you're right, and he's just picking out a tune. A more expert input from a musicologist would be helpful, though presumably the RAM will already have done that and drawn a blank. Their message just repeats what we knew already from their website: to be frank, without seeing the rear inscription(s) for ourselves - which would at least enable an assessment of its/their age - I don't see how we can go any further with this. Unless the labelling is old enough to pre-date its early C20th ownership, I will remain unconvinced that this is a portrait of *anyone* in the Loder family, let alone that it was painted by Bradley (whose suggested authorship hinges entirely on the sitter being a Loder). I should add that a similar image of a suitable Loder family member would change things. The "collection of family miniatures and sihouettes" deposited at the Victoria Gallery that Tim mentioned might help, though I suspect that if there'd been ones of John Fawcett or William, Nicholas Temperley would have put them in the book - as he does the ones of a much younger Edward James (c1826) and his father John David (1810). Neither of those help, as we already have near-contemporary images that probably rule them out. I have managed to extract an image of the book's list of illustrations showing these (attached) - the portrait under discussion *is*, in fact, in there, surprisingly identified as Edward without apparent qualification (but dated to c.1836 - perhaps to explain the lack of facial hair?). Nicholas Temperley is at the U. of Illinois - http://www.music.illinois.edu/faculty/nicholas-temperley . I have to go to bed now, and have much to do tomorrow, but will email him over the weekend...unless someone else cares to do so first! Osmund, you are entirely free to contact Nicholas Temperley (as I had suggested two weeks ago would be one forward). My thinking was and is that the home collections should be involved in these approaches, but as time has passed since I made this suggestion, it appears that the way is open for anyone else to do so. The 1836 portrait listed in the Temperley illustrations says 'in the possession of Janet Snowman', so could possibly be a completely different painting to the 1839 painting being discussed here. Ah no, SB, it's the same one: Janet Snowman is the RAM's Curator of art & iconography. It's an odd way for Temperley to describe it, though, unless Janet keeps it at home under the bed! Sorry, it would be more accurate to say that I *assume* it's the same one. The portrait used on the book edited by Professor Nicholas Temperley is a lithograph by the Hanharts - I don't have the full details at work at present but will let you know more. The lithograph is rare and I bought it some years ago at Grosvenor Prints in Covent Garden. The iconography with the quill etc in the lower left corner of the Loder painting is similar in idea to that painted by other artists, including what appears to be a scroll of music in the portrait of Paganini which is on a long-term loan from the Dover Museum and is hanging in the Academy's museum. See http://www.ram.ac.uk/museum/item/24148 in the museum's on-line catalogue. This appears to show an impression of a name 'N.Pag...'. Getting back to Loder, prior to conservation a few years ago the painting was examined by the NPG's senior staff in 1997 on behalf of the Heritage Lottery Fund, with the ensuing comment: 'Probably one of his brothers. ?some areas of paint on inside surface of glass. Also bitumenised, very dark but head looks well painted, condition generally bad'. The rear of the upper stretcher of the frame carried the label for Francis Draper, 67 Park Street, Grosvenor Square, and the frame itself was also later cleaned and a new backboard made. I will see if I can find an image in the conservation files of the scrawled name on the rear - it was in thick black pen and there was nothing further there. I should add that the painting is very much darker than shown here, as is the Paganini. At long last, some hard facts (for which many thanks): the label of the firm of framers. 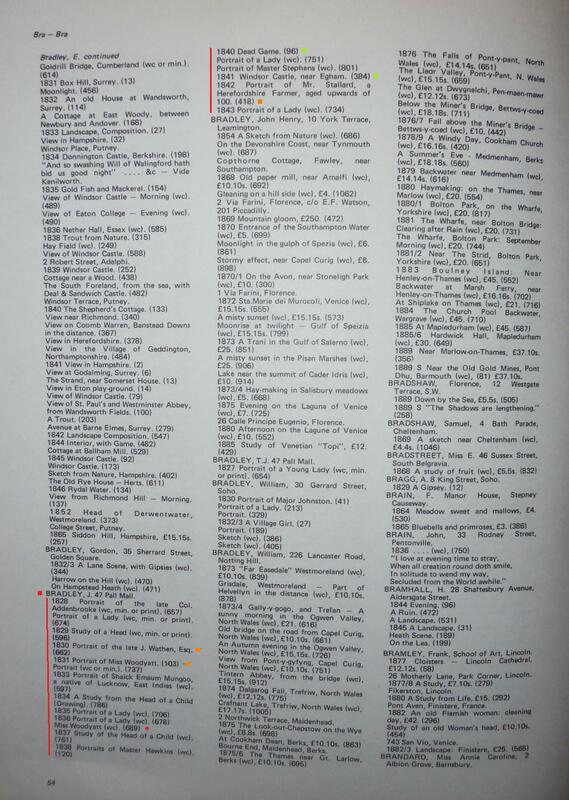 According to Jacob Simon's invaluable NPG online resource, British Picture Framers 1600-1950, Francis Draper operated from the Park Street address from 1887 to 1913. This tells us the frame went onto the picture some decades after it was painted. But this would have been a high quality frame by a firm that began in 1854/5, worked for the NPG from 1884 onward, as well as for the royal family, and for the governments of India, Australia, etc. So someone valued the picture and/or thought it important enough to get a very good frame made for it. 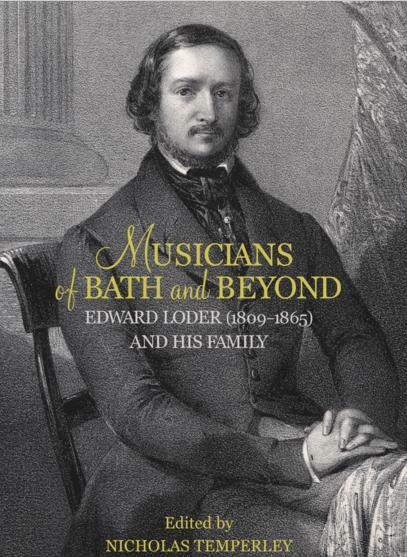 Attached please find a copy of the lithograph of a relatively youthful Edward Loder, as used on the cover of the book on the musical Loder family of Bath. Yes, I realised the lithograph was used as the cover image of Dr Temperley's book; but the illustrations list refers to a c.1836 'oil painting' (rather than a print) of Edward James Loder (#7.1), which understandably confused me. I suppose the Hanhart lithograph is *after* an oil painting - or is assumed to be, I can't quite read the inscription. Have I understood that right, Janet? I would hesitate to assume the Draper frame was made specifically for the portrait, though it certainly could have been - frames get swapped around all the time, especially by picture dealers. Many of them (as well as specialist frame dealers) buy pictures just for the frame, as I often have myself to enhance the presentation of a portrait I already own. While I do recognize that frames are often changed over, it is still not worth eliminating this information for that reason. Hill acquired the painting in 1915 which is not that long after the firm of Draper was at Park Street. The portrait was an esteemed gift from Hill to the Royal Academy of Music in 1927. We might assume that the frame has remained on it since then at least and that Hill had it framed. I don't really understand, Barbara. If Arthur Hill had a new frame made for the portrait after Feb 1915 (when he bought it from the picture dealer Walter Long), why would it have a 1913 or before Francis Draper label on it? Perhaps they were using up old stock - but to be still using ones with the old address a year and more after they'd moved seems surprisingly penny-pinching for a successful West End business (their telephone directory listing shows them already at Albany Street by Jan 1914). The Collection's notes say it was unframed, though it's unclear whether they mean when Hill acquired it, when Long did or when the preceding antiques dealer found it near Wincanton. If we assume, as you suggest, that the frame was made specially for it, it must surely be far more likely that it was Long (or the antiques dealer he bought it from) who had it done? Yes, initially I was thinking of old stock, given the dates of 1913 and 1915 are relatively close. When the RCM said it was unframed I took that to be when Long acquired it, prior to Hill buying it in February 1915. Thinking further about this, as you had already posted, we know that Walter Long was a dealer, in Southampton. It seems he did have a shop (or at least a premises that he advertised which also seems to have been his home as indicated by the census page you posted). He advertised in the art magazine Connoisseur (1908), p.207 (just a snippet view; there may be more) WALTER LONG, 48, The Avenue, Southampton PAINTINGS, ENGRAVINGS, Sc., CLEANED mid RESTORED . So the painting was in the hands of a known dealer who may well have been the one to have it framed (albeit by a London framer) and then the dates with Draper would fit. And it would be much more likely that a dealer would have it framed to make a sale, rather than a new owner. Listed as being a portrait of Edward James Loder, the composer and pianist, it has also been suggested that the sitter could be George Loder, violinist and orchestral leader, or John David Loder. It may be that Edward Loder also played the violin. The sitter is depicted wearing a fashionable black collar arrangement over his shirt. Illustrated music can be seen, lower left, and there is a rich red throw over the chair on which Loder is seated. He holds a violin.